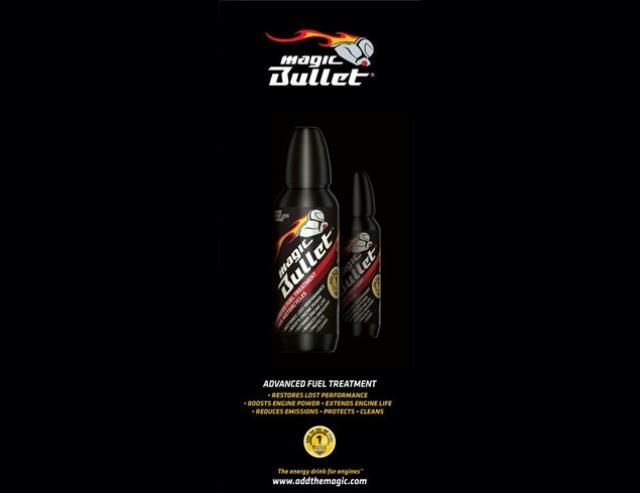 GLOBAL FUEL Treatments have announced the UK launch of Magic Bullet - the world’s first performance restoring fuel treatment formulated specifically for motorcycles. Magic Bullet dramatically restores showroom engine performance in any motorcycle by de-coking the engine, cleaning injectors and fuel lines and by extracting more power from the fuel. Used continuously it maintains peak engine performance, reduces smoking and emissions and extends engine life. Magic Bullet is added directly to the fuel and is available in 100ml One-Shot format which treats up to 20 litres of fuel. Magic Bullet is the result of years of development and testing to solve a recurring problem with all motorcycle engines. From the moment any motorcycle leaves the showroom it quickly loses its clean engine factory performance due to carbon build up in the engine. The result is steady loss of performance and a diminishing riding experience. Engines running with Magic Bullet run significantly cooler and ultra clean. Power is smooth and immediate through all gears and Magic Bullet extracts up to 18% more power per unit of fuel without the need for chemical octane boosters. Magic Bullet has already been adopted by track and road racers and has been used by at the Ulster GP, MANX GP and is on its way to the TT races with at least three teams in 2010.